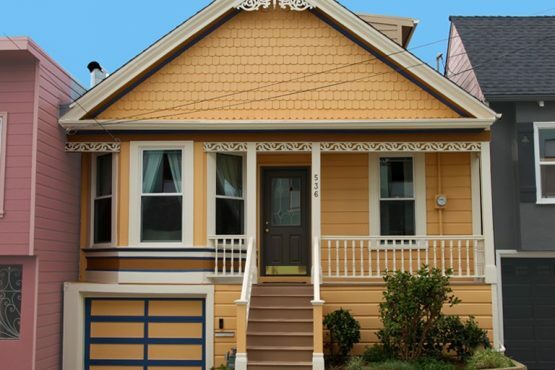 The main reason why most homeowners in the San Francisco Bay area attempt to paint their own home is because they believe that they will save a great deal of money. The fact is that you are most likely to end up with a result that does not completely satisfy you. Also, when you consider the time and effort you put into it, you will realize that the money you may have saved will be insignificant. What’s more, if you have decided to take on an exterior painting project for the first time, you could face critical issues and obstacles which you might not have considered. However, by hiring a professional painting contractor like Armstrong for your exterior painting, you can be assured that your home’s exterior will be well protected and you’ll boost its curb appeal. Professional painters will save you a great deal of time and will help you make the correct informed decisions about colors, paint quality and finishes. Also, if there is something about the colors you do not like, professionals have the equipment and know-how to remedy the situation much more efficiently than if you were doing it yourself. In the long run, not only will you save time and money, but you’ll avoid frustrating and stressful situations like preparing the surface areas correctly and making sure you have the right tools to complete a seemingly never-ending project. It is naive to believe that all you need to complete your exterior painting project is just a couple of cans of paint some brushes, rollers and maybe a ladder, but you’d be surprised at how many people actually believe this. Exterior painting is a great deal more complicated and demanding than repainting your child’s bedroom. Chances are the equipment you need to do a proper job won’t be lying around in your garage or workshed. Aside from brushes and rollers (in case of big jobs an air compressor and spray gun), you’ll need good quality extension ladders, scaffolding, drop cloths and a host of scraping/cleaning equipment and other material to prepare the surface before painting. Even if your home is a single-storey structure, you need to be aware of the numerous safety hazards you will be facing. These hazards could cause you injury and possibly loss from your work which could affect your income. Responsible painting contractors like Armstrong Painting invest in the right equipment, training and certifications to avoid and know how to deal with on-the-job hazardous situations. Why place yourself at risk when you can hire insured and trained professionals to do the job right? At Armstrong, we have painted more than 30,000 homes and, throughout our 50 years of experience, we have developed an effective painting process that guarantees high-quality results every time. In order to achieve the best results possible, you need to spend the necessary time preparing your home’s exterior surface for the new paint job. In fact, the preparation process can often take longer than the actual painting. Many do-it-yourselfers don’t realize the amount of effort which is needed for preparation nor do they have the skills and tools required to do the job properly. As a result, many DIY-painters skim over this part and hope they can use the paint to cover up all the imperfections. Unfortunately, the result of poor preparation is a poor paint job that will only last a fraction of the time you might have been expecting. A reputable painting contractor will always provide warranties for the quality of work and paint. At Armstrong, customer satisfaction has always been our top priority, therefore in order to ensure high-quality results, we use our exclusive AWS Specified Formulation on all our exterior painting projects. AWS refers to the Armstrong WeatherGuard System which includes the Application, Warranty and Specification of materials by Armstrong. Coupled with our thorough preparation, Titanium-Acrylic paints and our unmatched attention to detail, we provide your home and business with unparalleled protection and one of the most comprehensive warranties available. On the other hand, when you do the job yourself, you may have a warranty for the paint products you use but you will not have a warranty for your workmanship. If you are considering repainting your home or business, put our 50 plus years of knowledge and experience to work: arrange for your Free Estimate now!